Discover Preview’s hidden features for editing images and manipulating PDFs! Apple bundles the Preview app with every Mac, but few people realize what it’s capable of. The Mac experts behind TidBITS, Adam Engst and Josh Centers, have plumbed Preview’s depths to create a cheerful, colorful book that explains dozens of techniques for importing, viewing, editing, and converting images in Preview. The book also puts you in control of reading, annotating, manipulating, and encrypting PDFs. Packed with real-world examples and tips, the book teaches you how to bring files into Preview from a camera, iOS device, or scanner (or just from the Finder). Once you discover Preview’s surprisingly capable collection of image-editing tools, you’ll soon be editing imported photos by tweaking the exposure, color saturation, sharpness, and more. You can even mark up your images with circles, arrows, and text, plus numerous other shapes. 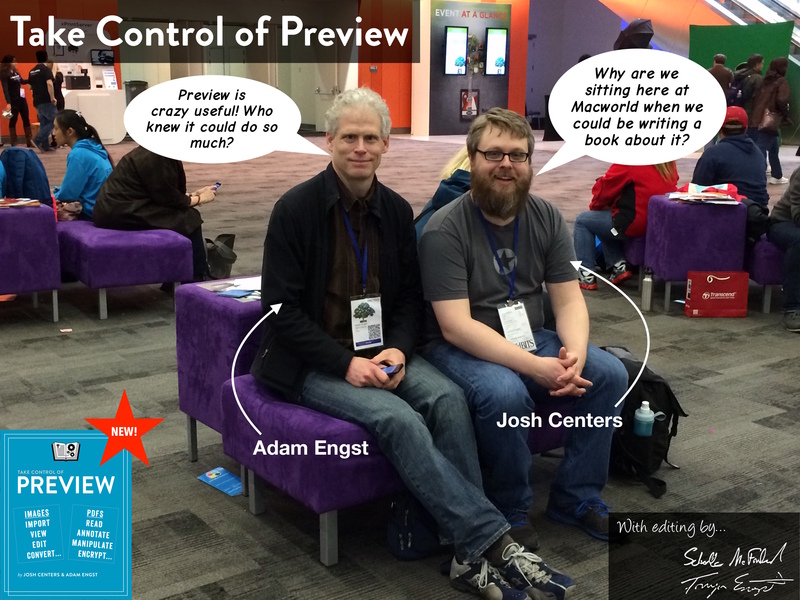 In the second part of the book, Adam and Josh focus on PDFs in Preview, describing how to configure Preview to make reading PDFs as fluid as possible. Since so many paper forms now come in PDF, the book shows you how to fill out PDF-based forms, complete with quick insertion of your digital signature. Those who read digital textbooks or who collaborate on documents will learn to annotate PDFs with highlights, notes, and bookmarks. You’ll even learn how to create PDFs from a scanner, the clipboard, and the Print dialog. Finally, Adam and Josh cover the two types of passwords you can use to protect your PDFs, explaining what each is good for. Import photos from your iPhone or iPad. Open hundreds of images in a single window. Trash unwanted images with a keystroke. Duplicate, rename, and move images without leaving Preview. Create a PDF-based image catalog. Magnify a portion of an image with a loupe. Tweak the white point and black point in photos. Make photos sepia or black-and-white. Edit a photo while comparing it to its original version. Export to any one of 20 formats, including HEIC (introduced in Mojave). View search results by rank or page order. Highlight text just like you would in a college textbook. Add notes to highlighted text and as freestanding objects. Review notes in the sidebar or Annotations inspector. Annotate a PDF with customizable shapes and arrows. Although nearly three years have passed since the initial publication of this book, Preview itself hasn’t seen any major changes—it’s still the app you know and love. Most of what has changed came with the release of macOS 10.14 Mojave and is related Mojave’s new Continuity Camera and screenshot features. Unfortunately, we’re sorry to report that, although Apple updated Preview to incorporate Mojave’s new capabilities, the company also introduced quite a few bugs and unwelcome changes, such as the Contact Sheet view displaying thumbnails as squares that squish the aspect ratio of the images or PDF pages they represent. We’ve called out such infelicities wherever possible so if you have trouble with Preview, you can verify that it’s Preview’s fault, not yours. We rejiggered “Configure Preview Preferences” to match how Apple moved preferences around. The options aren’t particularly different, but they’re in new spots. We added the topics “Importing from a Screenshot” and “Importing from an iPhone or iPad” to cover how you can bring content into Preview from Mojave’s new screenshot interface as well as directly from an iOS device. We removed mention of using iOS devices from “Importing from a Camera” now that Preview handles that through Mojave’s Continuity Camera feature. We updated “Importing from a Scanner” significantly to match Mojave’s scanning interface, which has fewer options than in the past. We added the sidebar “Preview’s Editing Tools Escape the App!” to note that Mojave’s new Markup tools work much as they do in Preview. We added tips explaining the View > Show Image Background command and how you can resize multiple images at once. We added some tricks in “Working with Shapes” for resizing, aligning, and layering shapes. We added a discussion of the new HEIC image format in “Choosing a File Format” now that Preview can open and export .heic files. We removed the section discussing how you can work with animated GIFs in Preview. As far as we can tell, that feature no longer works properly in Mojave’s version of Preview. It wasn’t particularly useful before, so it’s no great loss. We added some notes and warnings in “Annotate PDFs” to warn users about new annotation-related bugs in Mojave’s Preview. We edited a lot of screenshots so they show the new Markup button instead of the old one. Thanks, Apple! When you add text boxes and shapes to an image, they’re added in layers corresponding to the order in which you created them. For example, a rectangle created after a text box will obscure the text if you position it over the text, which may not be desirable. Other graphics apps tend to have Bring Forward and Send Backward commands to rearrange objects, but Preview lacks any such controls. Here’s the workaround: Option-drag the bottom shape to create a duplicate, which is newer and thus will appear on top of any other object. After making and positioning the duplicate, you can delete the original object.